MINERVA (MIcro/Nano Experimental Robot Vehicle for Asteroid) is a small robot lander whose weight is less than 600g. Although it is a tiny lander, MINERVA can investigate the surface of ITOKAWA using three small color CCD cameras. These cameras are installed at 5 cm height from its bottom. 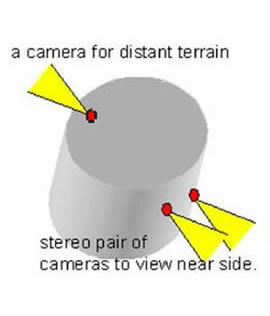 Two of the cameras make up a stereo pair that is capable of looking at distance from 10 to 50 cm. The pair can observe the detailed surface conditions at the landing area of MINERVA. A camera that can see further away is installed on the other side. It will observe more distant regions of the surface and can operate while hopping. Using the onboard camera of HAYABUSA, the best image surface resolution of ITOKAWA was 30 m during the global mapping phase and will be 1 Æ 2 cm during the touchdown operation. On the other hand, the cameras on MINERVA have a image resolution of less than 1 mm when they observe 10 cm distance objects and can observe minerals making up a rock. Moreover, MINERVA can investigate the size of regolith grains covering the surface of ITOKAWA. 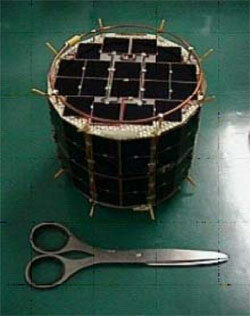 Among pins attached to the top and the bottom of MINERVA, six are thermal sensors which measure the surface temperature of ITOAKAWA. From temperature variation data, we will be able to tell whether the surface of ITOKAWA is rich in sands or rocks.